01: Olivia - After the extraordinary turn of events that shockingly left an imprisoned Olivia "over there," she fights to find her way home. Meanwhile, Peter and Walter try to move on with their lives unknowingly alongside alternate Olivia. 02: The Box - The story alternates to the Fringe Team "over here" where they investigate a mystifying case that people are discovered in a trance-like state that ultimately leads to their death. The unlikely suspect: a mysterious box. As Peter and Walter collaborate to study its properties, alternate Olivia presses on and turns up the heat on an unsuspecting Peter. Meanwhile, key information about the future is revealed when Walter and Nina meet at Massive Dynamic for the emotional reading of the last will and testament of William Bell. 03: The Plateau - In this case, timing is everything as a series of anomalous events lead the Fringe Division to investigate deadly incidents with unimaginable coincidences. As the freaky crimes continue to occur, the team is in a race against time to protect potential victims. Meanwhile, Secretary Bishop shares his strategic plan with Colonel Broyles as Olivia grapples with a heart-stopping vision. 04: Do Shapeshifters Dream of Electric Sheep? - Newton, concerned about the consequences of a distressing development involving a high-ranking official, is forced to call to action a sleeping shapeshifter. As Walter and the rest of the team gather evidence, they move the investigation to Massive Dynamic, where Olivia goes on high alert and Walter finds himself in a perilous situation. 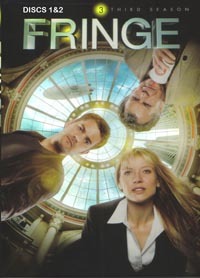 05: Amber 31422 - The alternate universe Fringe Division investigates a shocking breach of security when a twin frees his brother from a quarantined Amber area. As the team sets out to crack this sophisticated case, Walternate experiments over there more with Olivia as she reenters the tank. Meanwhile, visions of Peter continue to haunt Olivia about returning to the "other side." 06: 6955 kHz - Back "over here," the Fringe Division investigates a bizarre phenomenon when 15 people up and down the Eastern Seaboard, all suffer retrograde amnesia from listening to their shortwave radios on the same frequency. Much to Walter's dismay, Peter presses on with piecing together the mass destruction device. Just as alternate Olivia and Peter's chemistry deepens, the anticipation of Olivia's return escalates. 07: The Abducted - When a serial kidnapper "over there" strikes again, the emotional and familiar case hits home for Colonel Broyles, sending a determined Olivia to uncover additional details about the abductions. In the meantime, Olivia fights on and reunites with Henry to enlist his services on an intense and covert mission to return home.